To generate leads and attract new clients, real estate agents need a way to introduce themselves and keep in touch. Prospecting letters have long been an important part of real estate marketing. Many agents, though, find themselves at a loss as to what they should say. Fortunately, if you’re looking for inspiration on how to target buyers or sellers and win new clients, there are plenty of letter templates out there from which to choose. Buyer-Neighborhood – Let neighborhood residents know that a buyer is looking for a property in their area; ask if they’re interested in selling their home. Buyer-Interest – Inform people that pre-qualified buyers are ready to buy and are interested in their neighborhood. Expired Listing – Did sellers let their listing expire? Let them know you’re interested in meeting with them to go over a unique approach that will improve their chances of a sale. Buyer-Condo – Ask condo owners if they’ve considered selling their home to interested buyers. 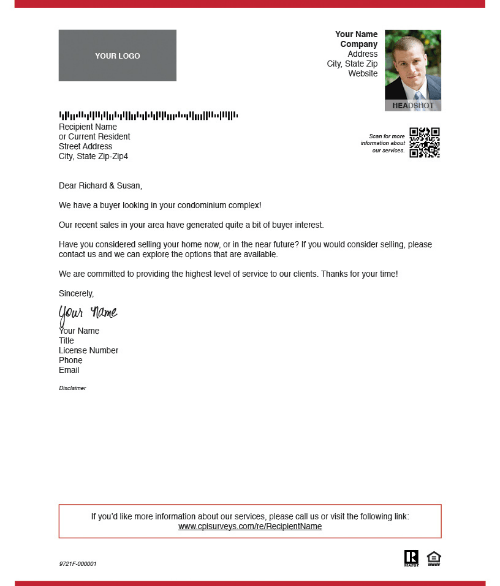 These pre-designed prospecting letter templates make it easy to up your real estate marketing game. Simply add your photo, company logo, signature, and other information such as disclaimers. And they come with a QR code and PURL for online lead generation. Calls to action, such as a request to contact you or an invitation to check out your website and current listings. Another smart strategy is to offer prospects something of value, like a free comparative market analysis. Statistics that are relevant to your area. A “P.S.” at the bottom of your letter may be the only thing a recipient reads! Put the most important message you wish to convey there. Use prospecting letter templates to help you list more homes, serve more buyers, and stay in touch with clients. Make them an essential element of your real estate marketing strategy and watch your business grow accordingly.